(Phys.org)—Some high mountain meadows in the Pacific Northwest are declining rapidly due to climate change, a study suggests, as reduced snowpacks, longer growing seasons and other factors allow trees to invade these unique ecosystems that once were carpeted with grasses, shrubs and wildflowers. The process appears to have been going on for decades, but was highlighted in one recent analysis of Jefferson Park, a subalpine meadow complex in the central Oregon Cascade Range, in which tree occupation rose from 8 percent in 1950 to 35 percent in 2007. The findings of that research, which was funded by the Pacific Northwest Research Station of the USDA Forest Service, were published in the journal Landscape Ecology. 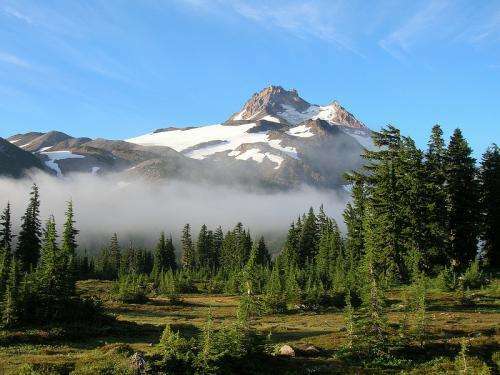 The changes in Jefferson Park are representative of a larger force that is affecting not only this beautiful meadow at the base of Mount Jefferson, scientists say, but many areas of the American West. "We worry a lot about the loss of old-growth forests, but have overlooked declines in our meadows, which are also areas of conservation concern," said Harold Zald, a research associate in the College of Forestry at Oregon State University and lead author of this study. "The first awareness of declining meadows dates back to the 1970s, and we've seen meadow reduction at both high and low elevations," Zald said. "Between climate change, fire suppression and invasive species, these meadows and all of the plant, animal and insect life that depend on them are being threatened. "Once trees become fully established, they tend to persist, and seed banks of native grass species disappear fairly quickly," he said. "The meadows form an important part of forest biodiversity, and when they are gone, they may be gone forever." "It takes a long time to melt a glacier or fill in a meadow," he said. "It's a useful barometer of climate change over decadal time periods." There's some suggestion that alpine meadows may simply move higher up on the mountain in the face of a changing climate, Zald said, but in many cases slopes become too steep, and poor-quality, unstable soils are unable to harbor much plant life. 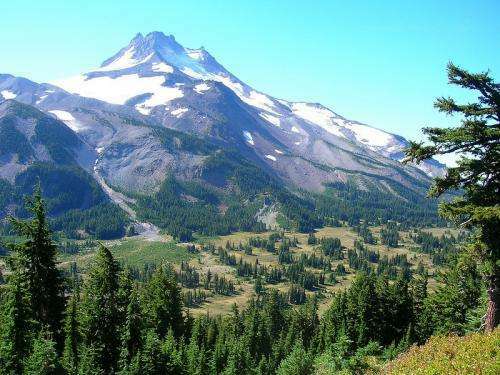 In other research in recent years, Zald said, he looked at meadows on lower-elevation mountains in the Oregon Coast Range – what are called "grass balds" on the tops of some of the higher peaks, such as Mary's Peak, the highest point in that range west of Corvallis, Ore. In a study of five Coast Range sites, Zald found that these "bald spots" had declined by an average of 50 percent between 1950 and 2000. The story has left out the role of beavers in meadow creation through flooding. Trap beavers and of course the meadows decline. Of course beavers remove trees too! Fire suppression may also have played a roll. Fire will clear an area and a meadow grows to fill the area. I read where Lewis and Clark nearly starved on their way through the Pacific NW. Large game needs such meadows and their must not have been very many at that time to produce the abundant herds that exist all over the country.